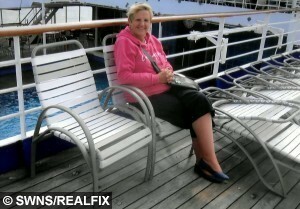 A woman who went on her first cruise to celebrate her 62nd birthday is still feeling seasick – THREE years later. 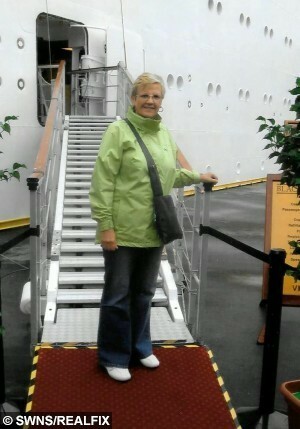 Grandmother Diane Morley and her husband Dennis were caught in a bad storm on the second night of their eight-day voyage to Norway in 2012. She said it was so rough she felt as if they were in a washing machine – and has still not recovered. Diane struggles with her balance and says her feet feel like they are on sponges and at one point things were so bad she contemplated suicide. She has been diagnosed with the rare Mal de Debarquement syndrome for which there is no known treatment. She takes Valium to control it but says she feels as if she is “still in the ocean waiting to be rescued”. 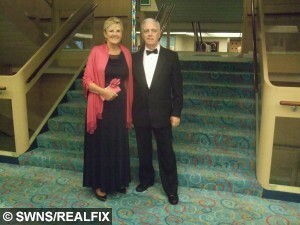 Diane, 64, a retired auxiliary nurse, and retired lorry driver Dennis went on the Black Watch cruise with firm Fred Olsen to see if they would like being on a boat enough to try a Caribbean cruise. She said: “Over the last three years it’s just got worse. Last year I had some surgery and had to go under anaesthetic and that made it worse. “The only way I can describe it is when you’re in a car and you can feel the engine revving up, I feel like that all the time. Mum-of-one Diane, from Herne Bay, Kent, has to wear sunglasses when she goes outside to block out bright sunlight and lighting. People often think she is drunk as she falls down and finds herself barging into customers at the charity shop where she volunteers. She struggles with basic household chores and has given up alcohol and coffee which seem to aggravate the condition. Even when she tries to sleep she finds herself wobbling and swaying, as if sleeping on a waterbed. The only time she feels ‘normal’ is in a car or on a bus but as soon as they stop and she gets out the seasickness begins again, and often is even more severe. She added: “I just got so down about it I was thinking about suicide, I could never have gone through with it but I just felt like I had lost my life. “It’s sort of a grieving process you go through, I wasn’t the same person who got on that boat. That person is still out in the ocean somewhere. “My husband couldn’t understand why I was struggling to begin with. I would say I felt sick and he just thought I was making an excuse for not doing something. Diane said two days after the cruise she could barely walk and felt as though she was on a bouncy castle. She said her GP dismissed as ‘a funny lady’ – and told her to go and sail round the world on a boat. She said: “I couldn’t believe it when he said that, I was just in shock. I think he meant it as a joke, thinking that would solve all my problems. She had previously been diagnosed with vertigo after losing her dad, retiring and moving house all in the space of two weeks in 2010. In 2013 she was diagnosed with Benign Paroxysmal Vertigo and was treated with regular Epley manoeuvres where her head was moved in a bid to balance out her ears. But one appointment left her so ill she was in bed for two days – and it became apparent that she was suffering from something else. A specialist at Kent and Canterbury Hospital eventually diagnosed her with Mal de Debarquement syndrome, which affects less than 1,000 people in the UK. Diane is part of a group called the MdDS Balance Disorder Foundation which tries to educate people about the little-known condition.